When I first started going vegetarian; starting with picking out the chicken, then cooking my exact same repetoir only sans meat, and eventually learning about gelatin and caesin and all the different places you can find beef tallow and other parts. Until I found the on-line vegan community, my diet was all about becoming more restrictive. But once I started finding vegan cooking blogs, I started to discover the wondrous depth and breadth of vegan cuisine. So, with my site update, I added a section called 'featured blogs.' These are simply blogs that I enjoy reading. Blogs that have influenced or inspired me. And, as often as I can, new blogs that could use some exposure. So, each month, I'll feature three (probably) different blogs. I'll share a nugget that they've posted and, in some small way, I hope to honor the author. Because there are some amazingly gifted and dedicated bloggers that are exposing the world to some amazing vegan food. Tofu Mom's blog is one of the first blogs that I started following. She's the self proclaimed Paula Deen of vegan cooking (definitely in a good way). She knows her way around comfort food and I've used many of her recipes. The recipe that I chose to cook is Green Chili Cornbread, made with green chilies and creamed corn. I must admit that I prefer it without the chilies, but I love the cornbread, the delicious creamy texture and crispy crust. So, if you're in the mood for cornbread, this recipe is a must try. And, incidentally, Tofo Mom will be doing thirty days of gravy for VeganMofo. Take that Paula Deen!! "But once I started finding vegan cooking blogs, I started to discover the wondrous depth and breadth of vegan cuisine." I think this is a great idea for a series of posts! 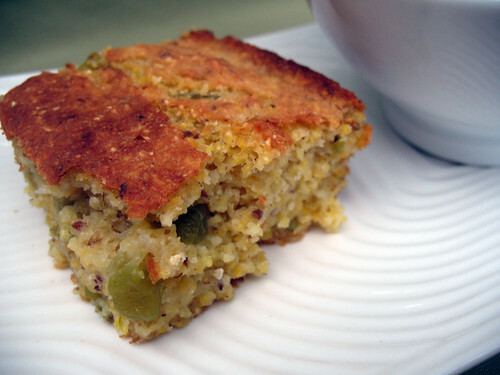 I love green chile cornbread! And of course, I love Tofu Mom! I second this being a great idea for a series of posts. I am right there with you. I recently met another vegan girl but before that I had no one to talk about vegan food with. Blogging seriously saved me. So many friendly people on here and so much to read. I love how her cornbread consists of so much more than just onions and jalapenos. Looks great! I love your idea for featured blogs, I might have to borrow it!